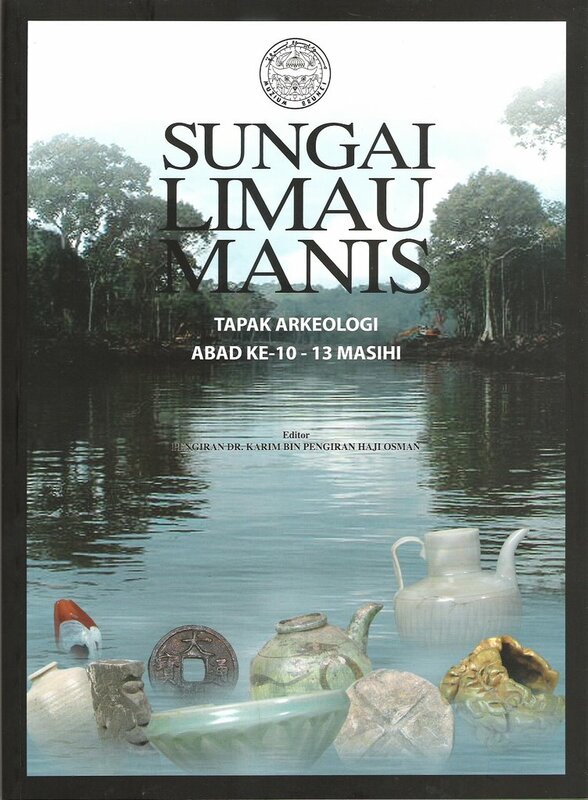 After the meeting, I asked my driver to get the book from the Museums publications unit entitled "Sungai Limau Manis - Tapak Arkeologi Abad Ke 10-13 Masihi" loosely translated as "Limau Manis River - 10th to 13th Century Archaeological Site" edited by Pengiran Dr Karim (published by Brunei Museums 2004 and can be bought at the price of $19.00). So after a whole night spent reading the book, the following is the gist of the Limau Manis site. The site was discovered accidentally when the river was widened (similar to the discovery at Tanjung Nangka). The discovery included some 50,000 potteries with the majority of them coming from China and with a few coming from Siam and Vietnam. The potteries are dated to the Song Dynasty (960 - 1296) and the early Yuan Dynasty (1296 - 1398). Chinese coins were also discovered from the earlier Tang Dynasty (618 - 906). More than 1,000 coins were discovered at the site ranging from the various Chinese Dynasties from 618 to 1117. Wooden artifacts were also found including that of a face mask. There were also many beads of multicolour, glass bracelets, stone artifacts, shells, animal bones, gold rings and bracelets, lead as well as human skulls and bones. Based on the sizes and types of the foundation logs being found, the site was definitely a town made up of many houses - some wealthy, some middle class and some poor houses. So a proper economic and social hierarchy was set up there with trading carried out extensively. The site can be as old as 10th century which will make it at least 500 years older then the current traceable history of Brunei's first Sultan. This town looked to be a pre-Islamic town as wild boars bones were found and these were hunted and eaten by the inhabitants then. There were no burial grounds unlike those at Kota Batu. Most likely the inhabitants did not bury their dead but left the dead in open coffins before taking the bones for a secondary burial. Due to its location which is very far inland, it was also speculated that this town though huge was not the main capital but rather served as a feeder point to the then Brunei's capital wherever that was in those years. If the server town is this big, then the actual capital must have been so much bigger. And if one feeder town existed, then several other feeder towns existed elsewhere in Brunei and in our former neighbouring states. This discovery is very exciting and really shows how extensive the rule of Brunei was in those years - rather than just as a thallasocracy (maritime empire), Brunei's rule extended inland as well. Apology for posting the comment here, which is related an earlier entry fo yours. Thank you very much for the invaluable information, particularly on the Bruneian - Singapore currency, which I just managed to read only now. However, what I find missing are the benefits from the Singaporean's perspective. Please elaborate more from this angle. I have not read the book but I find your conclusion over the extent of Brunei's rule on the basis of the discovery at Limau Manis, rather intriguing. It does not yet provide any proof of Brunei's rule nor does it dismiss them. It sounds to me that you are rewriting history even before proper investigation has been made. The artifacts were after all 500 years older than the alleged 1st Sultan of Brunei (I say alleged because I don't believe there are any traceable or tangible proof of this, apart from hearsay and legendary poems passed on by the older generations, but this is another story altogether). A lot can happen in 500 years and who knows, Brunei as we know it in our history books, does not yet exist but instead is made up of clusters of tribes headed by a Chief similar to the indigenous tribes of current Borneo. gabby: yes, you are right. anything prior to about 1700+ tended to be quite speculative. what i am indicating is based on other sources - such as the chinese sources - a country does exist then which already has relationship with China more than 1,000 years ago - now as to whether that country is the predecessor to the current Brunei - that's anybody's guess - so my speculation is as good as anyone else's. the other point is that we tended not to focus on the pre-islamic history of Brunei which if the Chinese records are correct, are actually much longer, therefore our history is much longer than that which only begins with the first Sultan. so back to the article, there is the speculation that this town can be just one town of many with no capital but based on historic sources, that's unlikely - so it should belong or be connected to a much bigger capital - as to whether that capital is old Brunei - i would like to think so but then i could be wrong and you could be right. whatever it is - it is fun to be a speculative historian! well well.. life is fun with more disagreement. anyway, i would just like to point out that how come things like these archaelogical sites are never made big news in Brunei? Are we Bruneians naturally ignorant of the significance of these finds or is it just not worth it to mention to the public? Thank you mr BR, if it weren't for your posts, i wouldn't have known more about Brunei's past.